I've probably been to Carson City roughly five million times. It is my go-to spot for Sunday-funday Steelers drinking and run-of-the-mill goofing off in the Southside. I've tried mostly everything on the menu, and the nachos are without a doubt your best option. 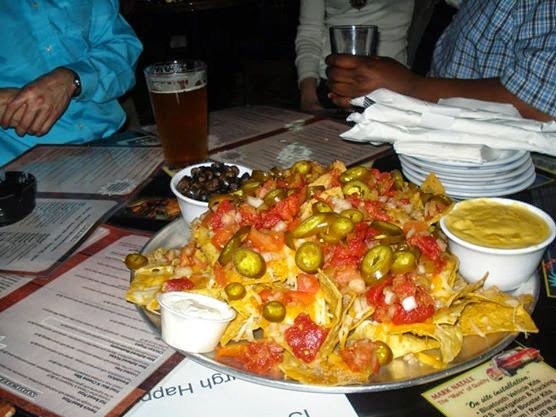 Not to trash talk the Carson City pizza boat, but the nachos are boss. They usually come out of the kitchen in under ten minutes heaped on a giant pizza tray. My only complaint is that these particular nachos pictured above could have been baked about a minute or two longer. The cheese wasn't melted to perfection. On the plus side they also did not come out as a soppy mess that required a fork. If I'm eating nachos with a fork, those are not nachos. 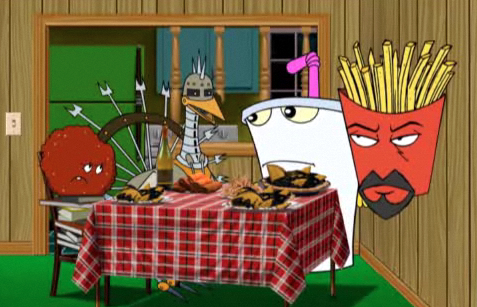 That's what I call taco pie, which is what the Aqua Teen Hunger Force eats for Thanksgiving dinner. Growing up, and for most of my adult life, I had always taken nachos for granted. I just assumed they were this culinary delight that had existed since the dawn of time. I mean honestly, it is hard to imagine a life without nachos. They seem to be such an obvious combination of ingredients. However, nachos were actually invented in 1943 in Mexico. Some dude named Ignacio threw a few old tortillas in an oven and the rest is history. Now we celebrate Nacho Day every year on October 21.